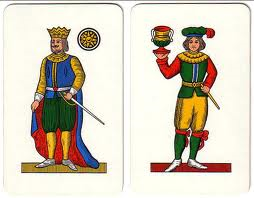 “7 and 1/2” is a popular Italian card game that can be ranked among gambling games. The game is played using Neapolitan cards (forty cards), but you also can use other regional Italian cards or even French cards (but in this case you should remove all the cards numbered 8, 9 and 10). Therefore, you must have four different suits for each value between ace and 7, plus the twelve figures (see the pics below). The ideal number of players for this game is 4-6 , but you can already play with 2 players up to a maximum of 10-12 . One of the players get the function of the dealer, which is not fixed, but changes during the game. In turn, the dealer plays one at a time with the other players. The maximum score to be reached just is “7 and a half” and the purpose of the game is precisely to achieve the highest score possible without ever busting, ie without exceeding the value of 7 and 1/2. The dealer must try to match or exceed the score of the challengers, of course without going bust. The dealer collects the amount wagered by the players if they go busting or getting a score lower or equal to his own. Conversely, the dealer pays the equivalent of the bet to players who surpass his score. The rating is calculated by adding the value of all the cards that each player has got. • The cards from Ace to 7 are worth as many points as their numeric value. That is, the Ace is worth 1 point, the 2 is worth 2 points … until to get 7 which is worth 7 points. 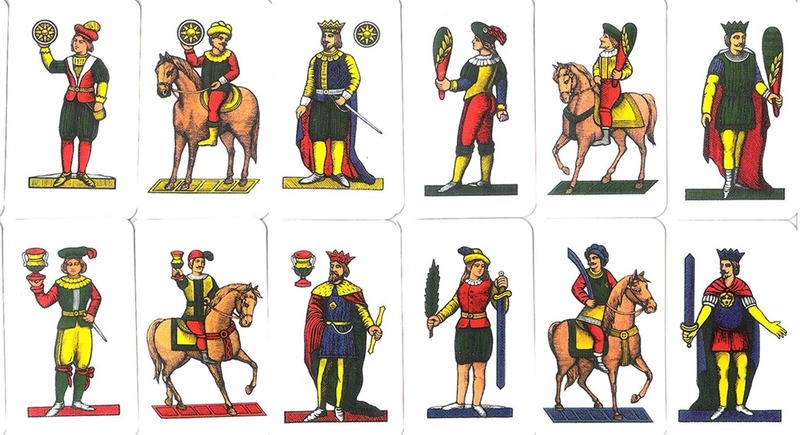 • The figures are worth half a point each [in Neapolitan cards they are: 8 (the woman), the 9 (the horse) and 10 (the king)]. • The 10 (the king), if it has the “seed of coins” (golden) assumes the role of “crazy” or “wild card” (it is the “King of Diamonds” in French cards), and it can take the VALUE of any other card to the discretion of the player who receives it. The game begins with a single card that the dealer gives to each player (to keep covered on the table and only the player can see). Now the player must play trying to achieve a score of 7 and 1/2 (or a value closest to it), asking dealer for other cards, which this time must be shown (uncovered on the table), and whose value has to be added (algebraic number) to the first received card. In this way, no one knows the player’s score. When the value of the received cards reaches half past seven or values close to 7 , the player will not ask for any more cards and will say, “I’m fine“, “I stop“, or “I see” and let the dealer to play with his (covered) card. Examples of seven and a half are: one “3” + one “4” + one figure, one “5” + one “2” and a figure, one “7” + one figure, or the “crazy” and one “7” (the best!). If the “Seven and a half” is reached using only two cards (7 + one figure), even if using the “crazy” card, we talk about the creation of “Real Seven and a half” or a “legitimate” one. In this case it is worth more than any other “7 and 1/2” reached with different cards. The player who achieves this score receives from the dealer a sum equal to double gambled and the player also becomes the next dealer. If more players make SEVEN and HALF in the same hand, everyone will be paid double, and the player who sits closest to the dealer’s right will become the next dealer, unless the dealer also made a “Real 7 1/2”. On the contrary, if the dealer is who reaches a “Real seven and half”, he collects the double gambled from all the players, except those who also made “Real 7 and 1/2” and those who were offside because busted, from which the dealer receives only the gambled sum. If one of the players realized a “Real 7 and 1/2” having the “crazy” and a figure, the dealer wins only if he got the same. If the dealer makes a “seven and half” by using more than two cards, it is “not legitimate”, and he wins even if the players get the same, except towards the “Legitimate 7 and ½ ”. • Look at the own card. • Make a bet by placing the corresponding amount of money near the covered card. Of course, the stake will depend on the card’s value. At this point, the player decides whether to ask for more cards or stop (to stay). The player may request as many cards as he wants and stop at any time. One at a time, all the cards, subsequent to the first, are dealt face up on the table, so the dealer can see them and realize the score that the player possibly has got. If the player “goes bust” he has to show the card face down and give the money to the dealer, who will proceed to play with the next player. • If a player busts or achieves 7 and Half must immediately point it out and discover the first card received. When someone goes bust, the bet is immediately withdrawn from the bank, then the game proceeds and the turn passes to the next player. The maximum score achievable is 7 ½ and in the event of a tie between players and the dealer, this one always wins. • The Dealer will win the wager to all players who have reached a score lower than his and all the players who went bust, otherwise he must pay the equivalent of the amount played by each player who beat his score. Once all participants have performed their play, it is the turn of the Dealer, who publically discovers his own card and decides whether “to stay” or take other cards. If the dealer busts, he must pay all the sums bet from the players still in game. When the dealer decides to stay or is Ok with his cards, each player has to discover the cards and see who has a higher score (winning) or lower (losing) compared with the dealer’s. Obviously, those who have achieved a higher score will receive the payment of the “bet” on the part of the dealer, who, on the other hand, collects the share played by those who have reached a lower value. At the end of the round, the Dealer will pass his role to the player sitting to his right, unless the players have not decided a priori that the Dealer loses the role only at the end of the cards in the deck. As said, who has got the “seven and half” also acquire the right to become the new dealer, bypassing the natural rotation between players. If more than a player got the real Seven and a half during the same hand, they have not pay the double, and the new Dealer becomes the player closest to the Dealer’s right. If, however, the Real Seven and a half is made by the Dealer, he will collect a double post by each player at the table, as he will maintain the role to the next round. 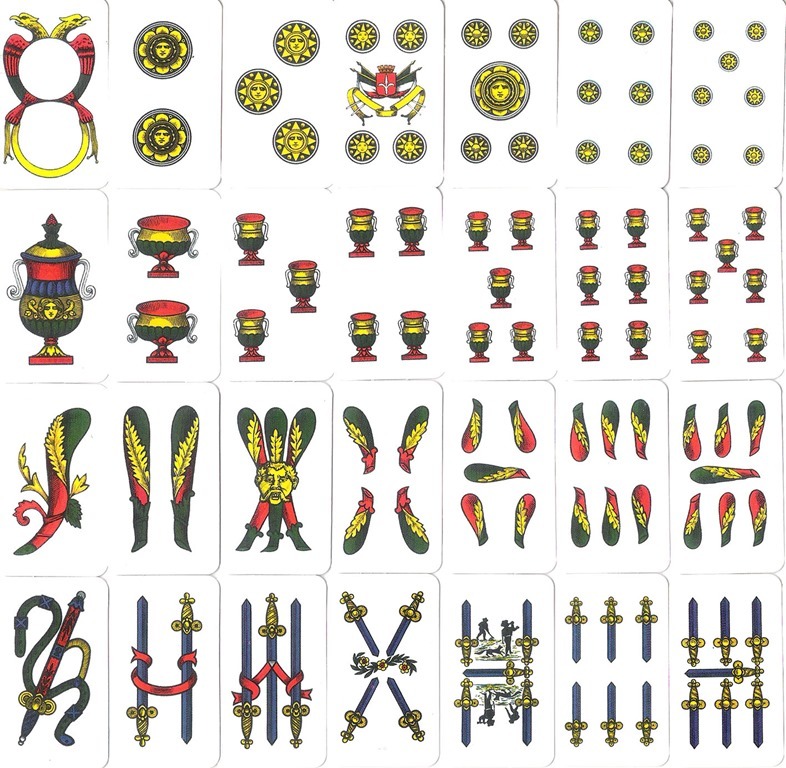 Here you can see the four seeds referring to the 12 figures (coins or suns, clubs, cups, swords) that are equivalent to the French card’s seeds hearts, clubs, diamonds and spades). These figures are worth half a point each. The King of Suns is the most important card because the player can easily make “Seven and a half”. Here’s the other cards, from ace to seven. 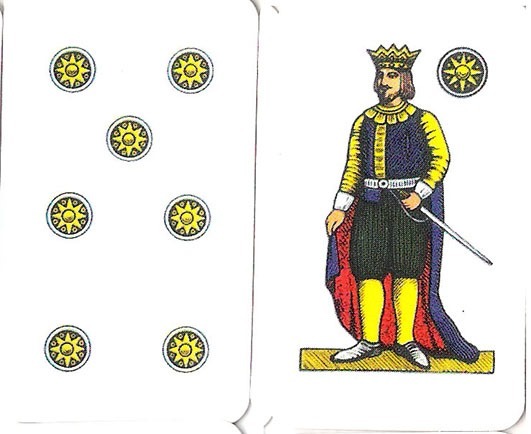 An example how the king of suns can be used to achieve the maximum value possible (7) with the received card (2), assigning the value 5 to the King. A player who reaches such a score should stop and stay. If you receive a card from 1 to 5, it is almost obligatory groped in asking for more cards, while it is reasonable “to stay” if you receive one 6 or 7, risking to bust. Let’s put aside Baseball or Playstation and take the opportunity that relatives and friends are at home to play all together with a board game. The board games are a phenomenon quite common in Western countries as a moment of aggregation, although their importance in social life also depends on national traditions. In Germany and the German-speaking countries, for example, the culture of the table game is much more widespread than in Italy. This kind of games is important as entertainment for family, especially for those suitable for all ages. Christmas, being a celebration that usually unites the whole family, also becomes an opportunity to play together, a way to spend a happy afternoon or evening with a board game. And in Naples, the oldest and widespread game played during the holiday season is the ” TOMBOLA“. It is a traditional board game just created in Naples in the eighteenth century. A home game as an alternative to the game of the LOTTO (lot), and often accompanied by a system of association between numbers and their meanings, usually humorous, deriving from “The SMORFIA“. The Smorfia is like the dream book, used to obtain the corresponding numbers from the various dreams to play the “Lotto”, along the lines of the Jewish Kabbalistic tradition (Kabbalah). For the Smorfia, a word, an event, a person, or an object, is transformed into one or more numbers, even through a fairly accurate coding that provides a different number depending on the context. For example, the verb (action) “to play” is represented by the number 79, but it changes if you meant to play football (50), cards (17), chess (22), and so on. For The Smorfia, the number 1 represents “Italy”, while the last number, 90, represents the “fear”, as well as the number five the “hands” and 18 the “blood”. For the uninitiated, the Lotto is a gambling game (like lottery), the most popular game in Italy managed by the State. The word “lotto” is derived from the French ” lot ,” which means both ” portion” and “fate.” The term, arrived in the Iberian Peninsula, is documented as “lote” in Spanish and “loto” in Portuguese. The French verb “lotir ” also means “to divide the lot” or “assign the lot”. But similar term can be found in the old English “hlot” (“a thing allotted”), which correspond to “Los” in modern German. The game consists of three weekly draws, conducted in eleven cities called “ruote” (wheels), in which are drawn 5 numbers between 1 and 90 without replacement, meaning that a number once selected is not put back in the urn. The game is to bet on one or more numbers (double, triplet, quadruplet, quintet), in the hope that they are selected in the “wheels” you had gambled. In fact, you can bet in a single wheel, multi-wheel or all-wheel. 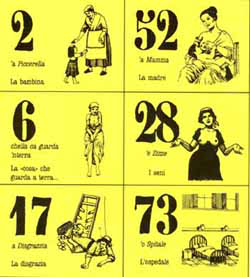 Neapolitans are very superstitious and often bet the numbers (arising from Smorfia) corresponding to particular events or situations, or resulting from some dream. Even the numbers that are part of a just bought car’s license plate, are among those that a Neapolitan can play to The Lotto. According to tradition, the Tombola game would be created in 1734 by a discussion between King Charles of Bourbon and father Gregorio Maria Rocco about the lottery. The first wanted it under public control, as the second considered it immoral on religious grounds. The compromise was found by banning the game during the holiday season, during which families organized themselves with a home version of the game, which soon became a custom in those days of the year. Basically the game of Bingo is similar to Tombola, in which participants are required to pay a sum of money which is then redistributed as prizes to the winners. The players have one or more rectangular “cards” previously “bought”, consisting of 3 lines, each with five numbers, from 1 to 90, printed on. Each time one number is drawn and it is present on one or more of the player’s cards, the player gotta cover it. In the traditional version of Tombola, the cards are simple paper cards and the numbers are can be covered with beans, chickpeas, lentils, pasta, or other materials available after the Christmas dinners, like hazelnuts’ shells. The Tombola’s cards are made in groups of six, so that in each group the numbers from 1 to 90 are present once only. A collecting box is part of the game, typically a small cone-shaped basket, filled with 90 numbers of wood. In turn, each player draws, at random, one number a time from the container, and go on until one of the players has covered all the numbers marked on one of his card. In such cases it is said that he made “Tombola”, and is the winner. Once put back in place the numbers and emptied the cards, the game resumes and another player can extract the numbers from the bowl. 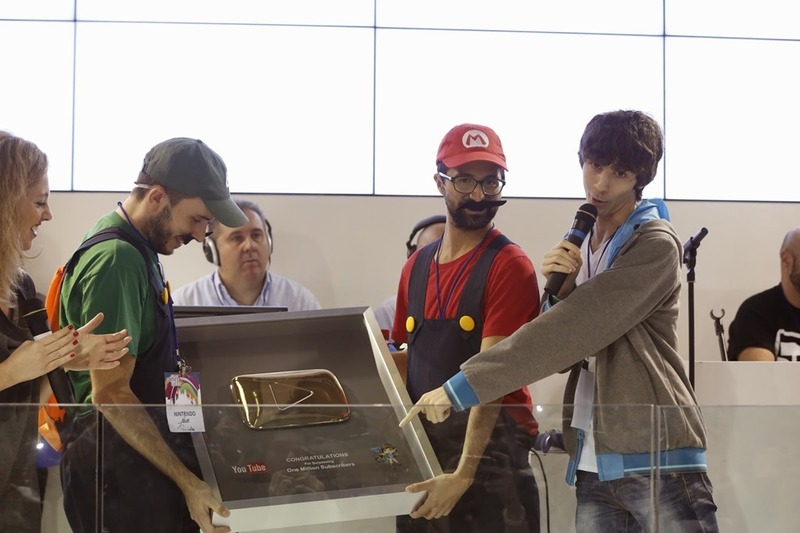 Depending on the amount of the prize money, players can decide to put at stake the double, the triplet, the quadruplet and the quintet, although it is the one who gets tombola to earn the top prize. Since Neapolitan tombola is normally played in a familiar context (as mentioned it is the traditional Christmas game), the amounts committed and won are usually small, and often have a purely symbolic value (you can “buy” three folders for 1 euro, for example). I like to buy 6 cards and to tell the truth, I’m not very lucky in this game, and although I only pay 2 Euros per session, after a couple of hours I could lose 15-20 euro! But as we say, more to comfort than anything else, “unlucky in the game, lucky in love”? As mentioned, it is mainly a way to get together and have fun, which children may also take part, who know the numbers, at least from 1 to 90! In the city of Linz in Austria, an entire building has been transformed into a giant Rubik’s cube that can even be “played” (although only at twilight). The cube’s faces correspond to different building’s area expressly illuminated with different colors, like the Rubik’s cube. The player interacts with a normal Rubik’s Cube (not colored), specially designed, which, via Bluetooth, sends the data (orientation and rotation of its blocks) to a computer placed in the building. This one runs the Puzzle Facade designed software, that transforms the rotation of the cube’s blocks in different colors, varying in real time the color of the lights placed in the corresponding building’s areas. Because of its complexity, only two sides of the building are lit and interact with the player’s interface (the cube). However, turning the cube, the player see directly on the building how the other two cube’s sides look like, setting accordingly. This does not preclude the solution of the game, but makes it just a little more complicated. Thanks to teachers, friends and relatives, Javier was able to work on all aspects of the project: concept, electronics, programming and realization, with the permission of the Ars Electronica Exhibition Centre. The City of Milan has proposed an amendment to the regulation of the municipal police, which would allow use of the spaces inside the condominiums to residents, for letting children play or other purposes, in compliance with the provided time slots. A good news indeed, if we consider that, especially in the North, the condos are closed and “sad” spaces, sometimes very big that do not have a real utility. Therefore, it is nice to know that these collective microworlds can find their own arrangement, like to be used by children to play or dwellers to organize little parties, without having to rent a special “site” to do it. Today, many parents are forced to accompany their children in small playgrounds or prohibit the young teenagers to go out alone. They look like prisoners who are brought out in small confined areas and watched over. Years ago, everything was simpler and no big concerns, our kids could play in the yard or even in the street. Fortunately, in the South this “custom” still remains in many countries. I have already had the opportunity to talk about this subject in some previous posts, and I am of the opinion that, at least for kids, this is the best way to socialize and make friends…. 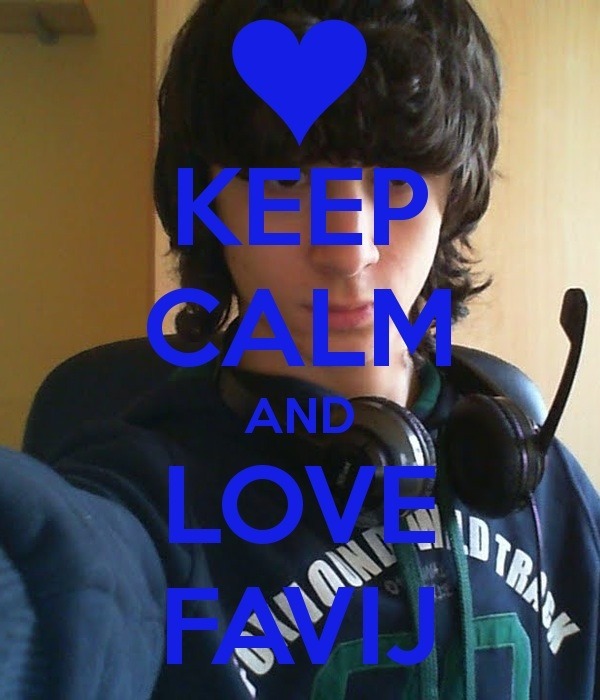 oh gosh yea! a lot better than Facebook!